The seventh annual Holiday Invitational goes down this weekend at the CrossPlex in Birmingham, Alabama. Live results for the meet can be found here. 9:00: Boys pole vault (high and low pits) Can only score from the high pit. 1:00: Girls pole vault (high and low pits) Can only score from the high pit. **Each in-state registering school should be prepared to provide one capable adult volunteer to work one field event for each meet that they participate in. We hope to not have to call upon you for this. **Coach's cards will be checked at the gate. Adults who do not have coach's cards will be charged a normal gate fee of $10. **¼ inch pyramid spikes only-athletes must go through a spike check before competing. A set of ¼" spikes will be available for purchase for $5 per pair of shoes at the spike check-in area. **Only athletes/coaches are allowed in the warm-up area. **We will have 2 pole vault pits going at the same time with different starting heights. Only those competing in the high pit will be eligible to score and receive awards. **Concessions & T-shirts will be available for purchase. **A swimming meet may be taking place at the same time as our track meet. Plan to get here early so you don't get caught in traffic. **Parking is $5 at The CrossPlex for this event. The City of Birmingham collects this fee. Parking in the shopping center lot and walking to The CrossPlex will get your car towed. **This is a high school sanctioned event. Only member schools may participate. Track Clubs and unattached athletes are NOT allowed to participate. Entry will be $10 per athlete and $10 per relay team. There will be a maximum fee of $300 per gender per team. ($600/school) Checks (or a copy of the purchase order for the meet fee) should be brought to the meet. Without such, athletes from the non-paying school will not be able to participate. These fees must be paid before future entry into subsequent meets will be allowed. See contract information at registration site for explanation and greater detail. 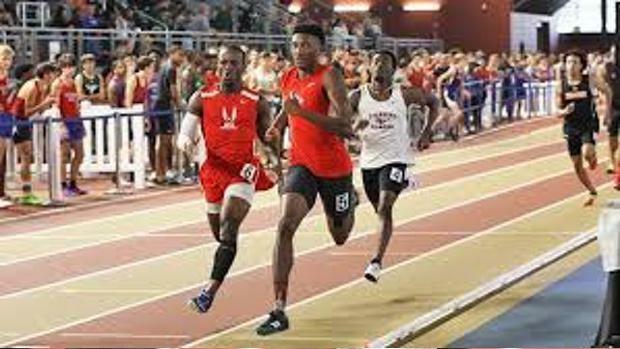 Schools can mail checks to: Alabama Indoor Track, 2240 Partridge Lane, Hoover, AL 35226. If mailed, bring PO for verification: No "check is in the mail" explanations allowed on race day. There is an entry limit of 4/event However, only the top three individuals on a team in each event may score. Additionally, each school may only score one relay. A varsity athlete may enter up to 4 events including relays. Registration will be online at http://al.milesplit.com Go to the meet calendar and find this meet. Starting Blocks and shots will be provided-leave yours at home. 6 lane hydraulic banked track. Timing will be FAT. Admission will be free for students, $5 for those 65 & over, $10 for other adults. AHSAA coach's cards accepted. Coaches w/o cards-$10.